OwnYourGram.com is a service which streams your Instagram photos to your own site in real-time. After signing in with IndieAuth, it sends your Instagram photos to your micropub endpoint. OwnYourGram detects when an Instagram photo has person-tags, and then passes those along in the Micropub request! 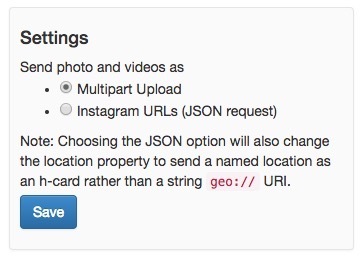 This feature helps turn Instagram into an IndieWeb client capable of supporting Player A's client needs in SWAT0. Source on GitHub, as well as the issue tracker. This page was last edited on 9 March 2019, at 04:59.